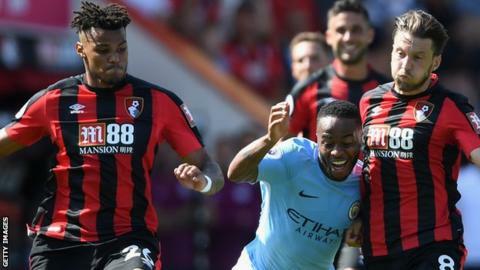 Bournemouth defender Tyrone Mings has criticised social media platforms for making it "all too easy" for racist abuse to take place online. In sharing an article about a man being jailed for 16 weeks for a racial attack on Manchester City's Raheem Sterling, Mings has received malicious tweets. "You get 16 weeks for this but on social media it's all too easy to be racist," tweeted Mings, 24. "Just hide behind a fake picture, fake details and get away with it?" In replying to abusive tweets, Mings singled out Twitter but stated the ease with which racist messages could be posted on social media was "pathetic". One Twitter user pointed to an account which had targeted Mings being suspended, but the former Ipswich player said stopping the content was "impossible". "It's the organisations that need to prevent it rather than us trying to cure," added Mings, who has almost 39,000 followers on Twitter. On Tuesday, bosses of Twitter, Facebook and Google were questioned by the Home Affairs Committee about what they are doing to combat hate speech. Committee chairwoman Yvette Cooper said that as three of the "richest companies in the world", the firms "needed to do more". On Monday, Twitter announced changes to how it will combat hate speech having sought guidance from its own Trust and Safety Council, a group consisting of representatives from more than 40 organisations dealing with, among other things, anti-Semitism, homophobia, sexism and racism.